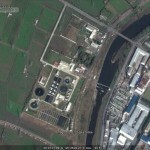 Flooding in North Korea typically occurs near the West Sea, not near Namyang, which is located in Onsong County, North Hamgyong Province. In areas like Sinuiju, downpours during the rainy season coupled with high tide in the West Sea are known to drive up the water levels of Amnok (Yalu) River and lead to flooding; however, such an occurrence is rare in areas adjacent to the Tumen River, particularly in the hillside city of Namyang. It is therefore believed that unusually heavy rain, which battered the greater northeast region, contributed to the flooding, and was likely exacerbated by the use of embankments as small plots to grow produce by local residents, whose livelihoods depend on doing so. Weeding and digging around this area in order to plant beans and other crops is thought to have compromised the strength of the river banks, yet no preventative measures were put forth by the authorities. 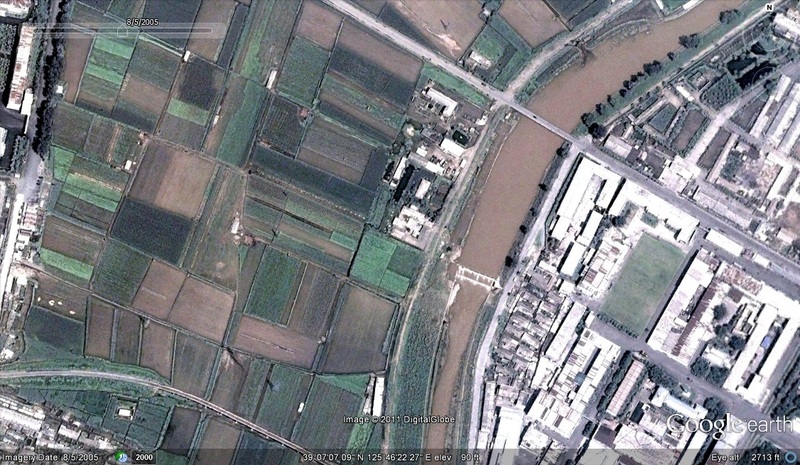 DailyNK has a few pictures of Namyang taken from the Chinese side, showing flooding and destruction. 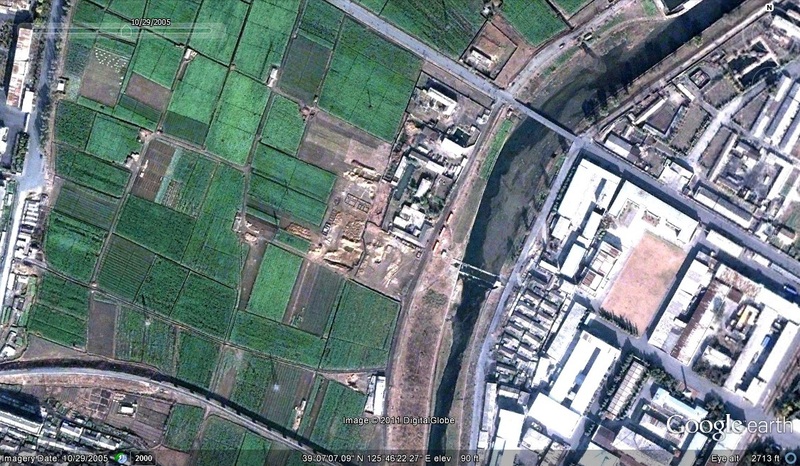 Namyang city, Onsong county. Photo: Benjamin Katzeff Silberstein. 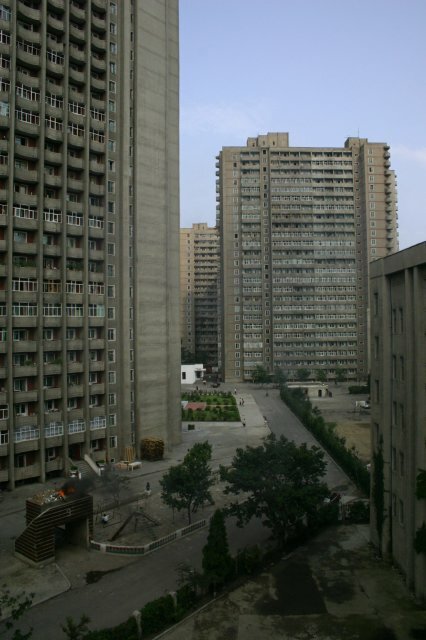 Namyang, Onsong county. You can see the train station to the right in the picture. Photo: Benjamin Katzeff Silberstein. 국제적십자사 IFRC가 큰물 피해를 입은 함경북도 지역에 긴급구조팀을 파견해 구조활동을 펼치고 있다고 유엔이 밝혔습니다. 타판 미슈라 주 북한 유엔 상주 조정자 겸 유엔개발계획(UNDP) 상주대표는3일 북한 내 유엔 기구들과 비정부기구 관계자들에게 보낸 이메일에서, 태풍으로 인한 북한 홍수 피해가 예상보다 훨씬 심각한 것으로 파악되고 있다며 이같이 밝혔습니다. ‘VOA’가 3일 단독으로 입수한 이 이메일에 따르면 이번 폭우로 함경북도 지역이 가장 큰 피해를 입었으며, 특히 회령시과 문산군, 연사군, 청진시, 김책시, 경송군, 길주군, 라선시 일대에 큰 피해가 발생했습니다. 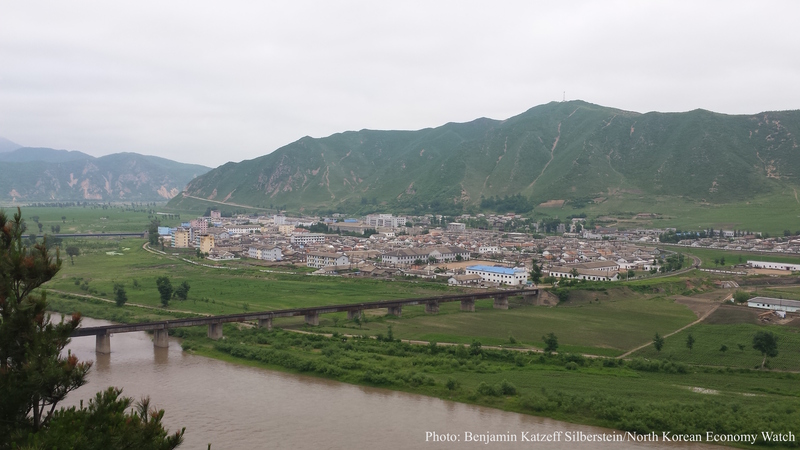 Summary in English (by NKEconwatch): according to Tapan Misura, UNDP country representative in North Korea, North Hamgyong province has been struck by flooding in the past few days, to a much worse degree than expected. Especially Hoeryong, Musan, Yeonsan, Chongjin, Kimchaek, Kyeongseong, Kilju and Rason have taken strong hits. 또 홍수로 10여 명이 사망하고 1만 여 가구가 피해를 입었으며, 6천7백여 가구가 파괴되고 7천가구가 파손된 것으로 알려졌다고 미슈라 상주대표는 밝혔습니다. Summary in English: As a result of the flooding, ten people have died, about 10,000 homes have been damaged, 6,700 homes have been destroyed and another 7,000 homes have been broken/damaged. 특히 함경북도 회령시의 피해가 심해 가옥 2천개 이상이 물에 잠기고 1천개 이상의 집이 완전히 파괴됐다고 밝혔습니다. 또 적어도 2만6천여 가구가 식수도 없이 고립된 상황이라고 밝혔습니다. 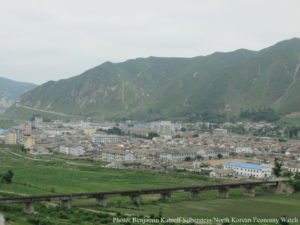 Summary in English: destruction has been particularly heavy in Hoeryong in North Hamgyong, where 2,000 houses have been submerged in water, and over 1,000 houses have been completely destroyed. Moreover, at least 26,000 households now lack access to drinking water. 미슈라 상주대표는 함경북도 일대에 지금도 계속 비가 내리고 있고 앞으로 며칠 간 비가 예보돼 있어 피해가 더 늘어날 것으로 보인다고 말했습니다. Summary in English: According to Misura, rain is continuing to fall in North Hamgyong, and will do so over the next few days, so the destruction is expected to grow. It rained heavily with strong wind in North Hamgyong Province and other parts of the DPRK from August 29 to September 2, affected by a combination of typhoon-10 and low pressure field formed in the northwest. According to data available at the State Hydro-meteorological Administration, the rainfall reached 320 mm and 290 mm in Kyonghung and Puryong counties of North Hamgyong Province from 00:00 Monday to 12:00 Friday. And over 150 mm of rain fell in Onsong, Kyongsong, Kyongwon, Yonsa and Hwadae counties of the province as well as some parts of Ryanggang Province including Taehongdan County. The River Tuman flooded some areas of Hoeryong and Rason cities, Musan, Onsong, Kyongwon, Kyonghung and Yonsa counties, causing big damage. Especially, flood heavily hit Hoeryong City, Musan and Yonsa counties, claiming 15 people missing in Hoeryong. 17 180 houses were partially or completely destroyed with at least 44 000 people homeless in North Hamgyong Province. Damage investigation goes on there. And a campaign to help victims and heal the damage is being conducted in the flood-stricken areas. Pyongyang, March 22 (KCNA) — Today marks World Water Day. In this regard, Ri Nam Hyon, section chief of the DPRK Ministry of Urban Management, noted that the government has striven to supply quality drinking water to citizens on a normal basis. The DPRK government has made big efforts to the introduction of gravity-fed water supply system. This introduction began in the township of Pukchong County, South Hamgyong Province, in 2003 while a brisk work was launched to explore the headstreams throughout the country. At present, the gravity-fed water supply system has been established in 35 cities and counties, including Rason and Wonsan, across the country. The establishment of this system was carried out in cooperation with the United Nations Children’s Fund and other international bodies and governmental and non-governmental agencies of various countries. A speech made by North Korea’s young leader Kim Jong-un last year that detailed his plan on land management has been published in Chinese, a state media report said Tuesday, in what is believed to be his first Chinese-language publication. The Chinese-version of Kim’s speech, titled “On Brining About a Revolutionary Turnabout in National Land Management Work to Meet the Demand of Building a Powerful Socialist State,” was published on Sept. 3 in Dandong, China’s border city with North Korea, China News Service reported. According to the report, the speech by Kim was published by a Chinese printing firm named “Longshan,” but it did not give other information, including the name of its publisher or whether the publication is being sold. Kim, who took power in late 2011 following the death of his father, Kim Jong-il, made the speech on April 27 of last year, while convening a meeting of key members of the North’s Workers’ Party of Korea and economic organizations. 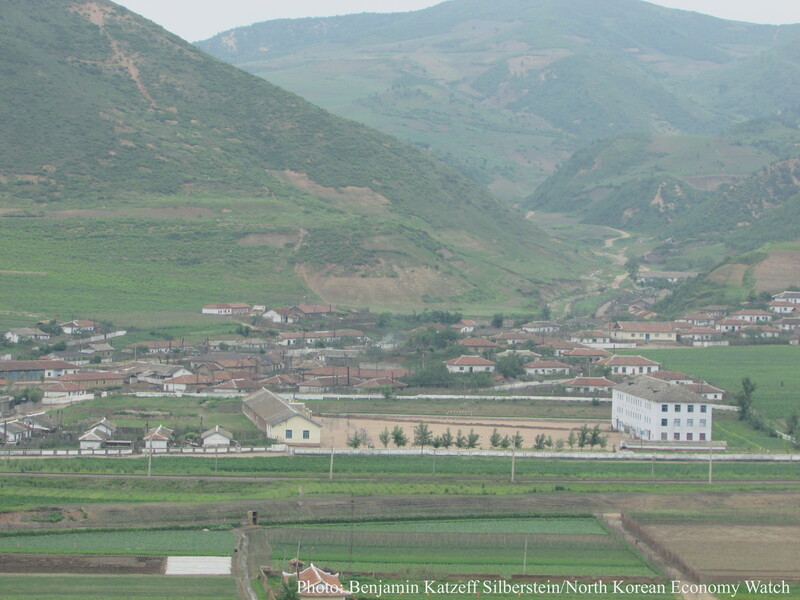 During the April 27 meeting, Kim said, “Land management is a patriotic work for the eternal prosperity of the country, and a noble work for providing the people with better living conditions,” according to a report by the North’s state media at the time. 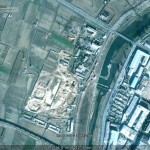 UPDATE 1 (2012-11-19): Aidan Foster-Carter has sent me a Naenara link to Kim Jong-un’s full remarks (published in English). I have put the entire speech into a PDF which you can view here. You can see the facility in Google Maps here. 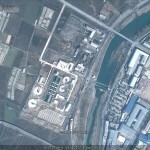 Pyongyang, November 9 (KCNA) — The Ryongsong Water-purifying Station has been built on a modern basis. Latticing, detritus chamber, settling basin and others were successfully built to ensure the flow of clean water into the River Pothong and provide the people in the capital city with better living conditions and circumstances. A ceremony for its completion took place on Wednesday. Present there were Vice-premier Jon Ha Chol, officials concerned, scientists, builders and workers. Hwang Hak Won, minister of Urban Management, addressing the ceremony, noted that the station was perfectly completed in a short span of time. He stressed the need to strictly abide by the requirements of the technical regulations in managing and operating the station, further perfect the processes and make green-belt in its surrounding area. 1. 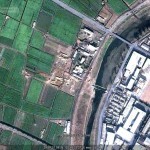 Some Pyongyang water sanitation projects have been funded by Kuwait Fund for Arab Economic Development. 2. 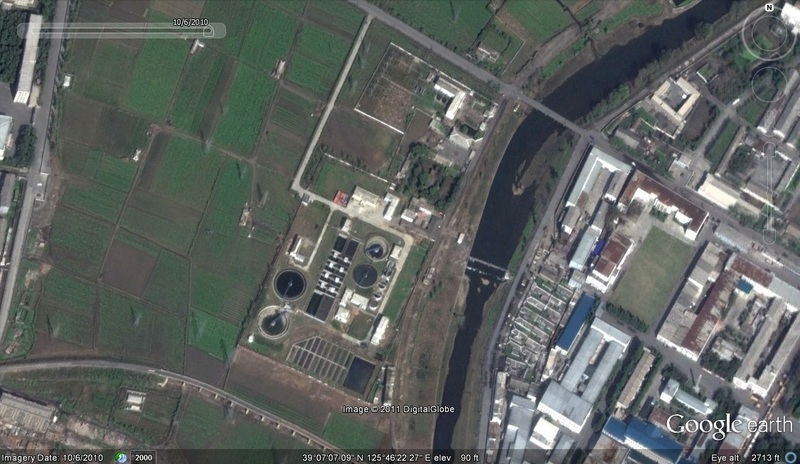 Here is a previous post on waste management in the DPRK. 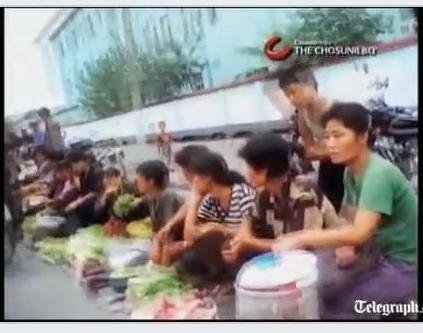 The video, obtained by Chosun Ilbo media agency, shows people [in Sinuiju] living in tents on streets with their water damaged belongings. Others can be seen buying water from a salesman. The price of water has increased since the floods, according to the agency’s source, with a bowl costing 6 pence. The usual monthly wages are around £1.30. Heavy rains in July and August have hit food production that, even in a good year, falls a million tonnes short of the amount needed to feed North Korea’s 23 million people. According to the Chosun Ilbo, North Koreans in Shinuiju were complaining about the government and their inability to help the area properly. Last week the South Korean government offered to provide £5.5m in emergency aid, including food, relief materials and first aid kits – but not rice nor construction equipment, as per Pyongyang’s request. North Korea’s request was made through the Red Cross at the weekend, and is being reviewed, the Unification Ministry said in a statement. South Korea has been reluctant to give rice to the North because it is worried it will not reach the people who need it most. Pictures of the flooding can be found here. North Korea formally launched a medical videoconference network Tuesday aimed at giving smaller, rural hospitals access to specialists in the capital Pyongyang with the help of the World Health Organization. WHO has been providing cameras, computers and other equipment to North Korea to help the reclusive, impoverished country connect a main hospital in Pyongyang with medical facilities in 10 provinces. The system is designed to allow doctors to talk to each other to provide additional services to rural patients. On Tuesday, North Korean health officials and visiting WHO Director-General Margaret Chan held the formal inaugural ceremony for the system at the Kim Man Yu hospital in Pyongyang, according to footage from broadcaster APTN. “This is an excellent vision because it meets the needs of the government,” Chan said. Chan, clad in a white gown, later tested the system by talking with provincial doctors via video link. One unidentified doctor at Jagang province, about 150 miles (240 kilometers) north of Pyongyang, told Chan he is satisfied with the system because it’s too far for his patients to visit specialists in the capital. She arrived in Pyongyang on Monday, becoming the U.N. agency’s first chief to visit the communist country since 2001.
WHO opened its office in Pyongyang in 2001 and has coordinated the purchase of medical equipment and supplies for North Koreans. The world’s health body says on its Web site that it is currently focusing on strengthening the North’s health infrastructure. World Health Organization Director-General Margaret Chan arrived in North Korea on Monday on a rare visit to the isolated country. The U.N. body has said Chan will spend two days in the reclusive communist country _ the first chief to go since 2001 _ to tour health facilities and meet the country’s health minister. The WHO has not provided details of Chan’s itinerary, but the Korean Central News Agency said in a dispatch that Chan arrived in Pyongyang on Monday. The dispatch said the government held a reception for Chan, who arrived the same day as Red Cross and Red Crescent officials. It was not clear if the visits were connected. The North faces chronic food shortages and has relied on outside assistance to feed much of its population since a famine believed to have killed as many as 2 million people in the 1990s. Malnutrition, dysentery, and vitamin and iodine deficiency are believed to pose serious risks among children in the country, which also faces a shortfall of hospitals and lacks an efficient state health care system. UPDATE: Lots of additional helpful information in the comments section at the bottom of this post. 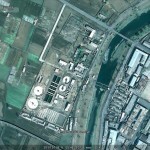 ORIGINAL POST: It is not glamorous, but it is interesting–and largely unexplored. In all the time I have spent visiting or investigating the DPRK I have been curious about how they handle waste management and sanitation. There is not much written on the subject (other than periodic reports that people collect their solid waste for fertilizer, or that school kids were sent out to collect it during the Arduous March), so I thought I would kick off a discussion about the topic and if any readers can point out more information, I would appreciate it. 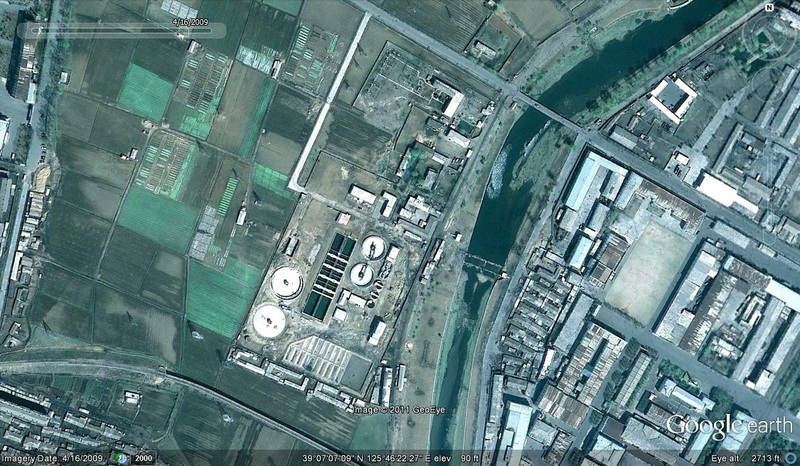 On my second trip to the DPRK, I saw a garbage incinerator next to the Moranbong Middle School. 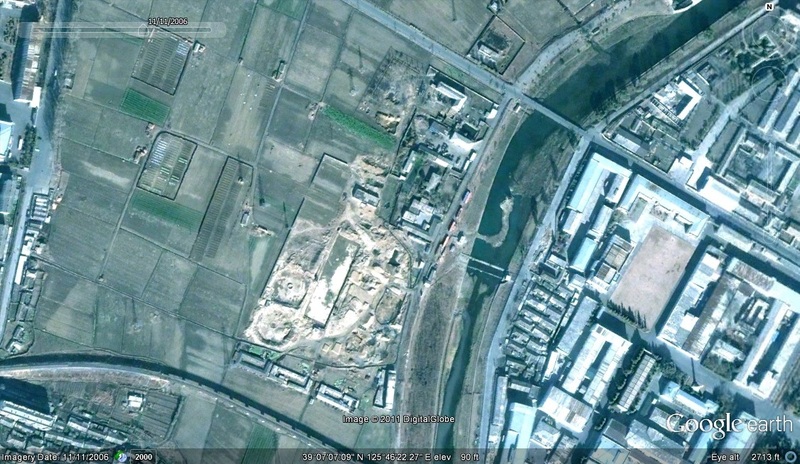 The coordinates are 37°57’12.80″N, 125°21’36.11″E in Ongjin (South West). It is approximately 33 meters in diameter at its widest point. There is no telling what is in there or how well it is sealed off from the local water table. If any former residents of Ongjin happen to see this post and can fill in the details, please let me know. One highly-qualified reader asserts that there is no way this could be a landfill, but has no idea what it could be. If anyone else has a hypothesis about this location, please let me know. 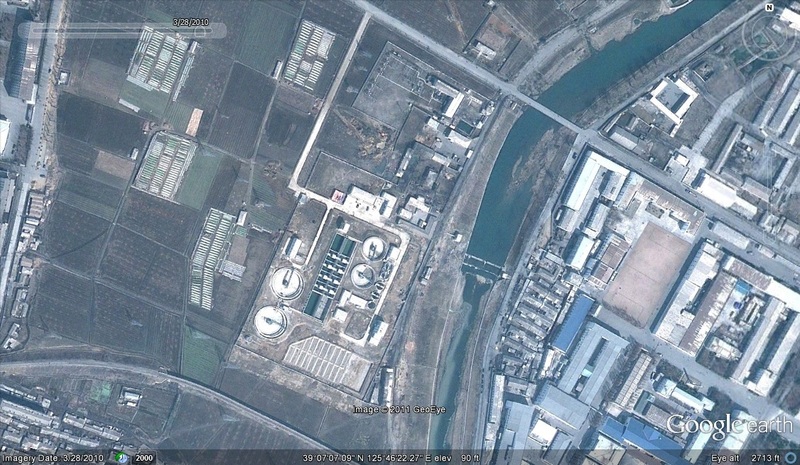 Kuwait was reported to be lending the DPRK $21m to update its water and sewage facilities. The indispensable Stalin Search engine has more on Kuwait and the DPRK. So if anyone knows of any papers, etc. on sanitation in the DPRK, please let me know. 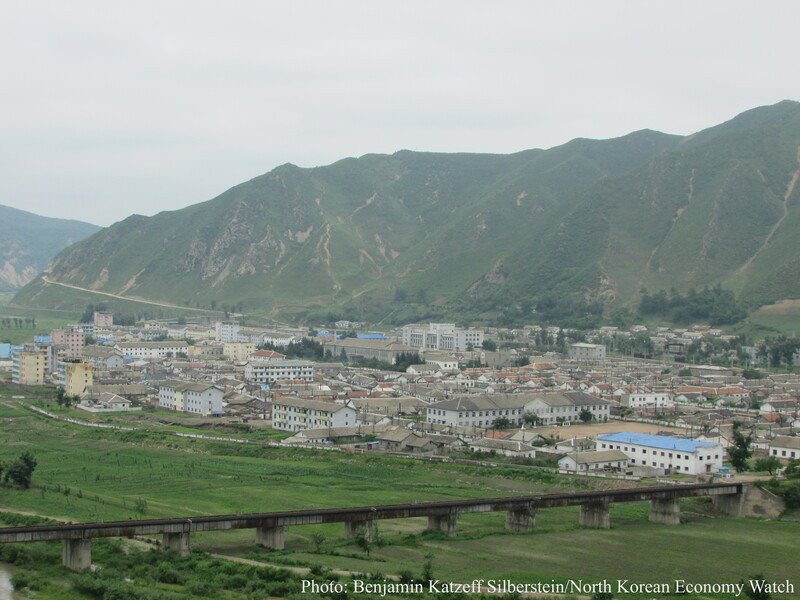 Amidst the trend of increasing numbers of civilians trying to make ends meet through trade in the wake of the July 1st Economic Management Reform Measure, medical students in North Korea have started doing business by drawing water from the Yalu River. However, due to the territorial nature of the Yalu River, water-selling, and attendant incidents of violence in order to grasp commercial rights, have become more frequent. According to the source, the medical school students used their handcart to crash into the couple’s sleigh. The husband, angry at this, hit one of the students, which provoked the two remaining students to collectively assault the couple and flee. In Hyesan, Yangkang Province, as water provision to civilians became more erratic due to failing subsistence, the business of drawing supplies from the Yalu River to take to far-flung regions started springing up. Not only does the business not require much capital, but water can be fetched from the Yalu River with a handcart or a sleigh and be sold in residential areas, so it is popular among college students who come from farming regions to Hyesan, or among middle school students. “Selling water is mostly monopolized by middle school and college students. This is a job that ordinary people will take up as a last resort,” the source said. “In Hyesan right now, 50 liters of water costs around 300 North Korean won, and a 70-liter Chinese bucket sells for 400 won,” he explained. Hyesan, which began receiving aid from international organizations in 2003, was the pride of the North Korean authorities, especially since the completion of a “natural water supply system” which took two years to construct. However, as a result of simultaneously burying the water and the sewage system at the time of construction, the polluting of the city’s water resulted. 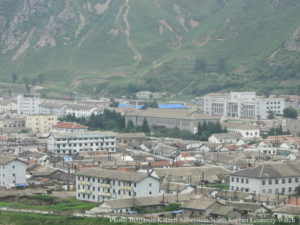 The residents of densely populated areas, which are located mostly on hillier regions relatively far from the Yalu River, have not been receiving tap water, noted the source.